As I was saying above, I make so bold as to note that once again, looking for a sign of climate change at the Oregon coast, I can’t find any. That’s not to say there aren’t any. But in terms of sea level, if there’s been a change over the last 20 years or so, it’s too subtle to be felt or seen. And if change is too subtle to be seen, maybe we ought not to use it as the reason for forcing fundamental changes affecting our economy, that is, how people are able to make a living and arrange their lives. So it makes sense to me that the new federal administration is backing off regulations or policies the previous administration pronounced with the aim of slowing climate change around the world. I did notice one thing this weekend: No living barnacles on the rocks in the estuary of the Yachats River. 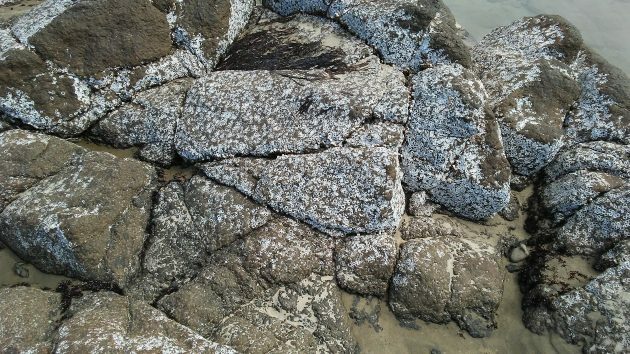 The rocks are covered with the traces of where barnacles used to be glued to the stone. But even under water, the few remaining barnacle shells crumbled when I poked them. The remains of barnacles on the rocks rising from the sand in the Yachats River bay. Well, the starfish are pretty much gone. Hasso, when you referred to crusty old barnacles, at first I wasn’t sure if you were referring to you or to me. Thanks for clearing that part up. But at least we haven’t disappeared, like those on the rocks. I have no answer on that score but echo your thoughts on climate change. It seems reasonable that it would be much more economical and sensible to adapt to a slowly-changing climate as the change occurs than to go off the deep end at great expense. Hasso, your evaluations have been heard in Washinton DC and the nation. The skeptics are in charge and are correcting the destructive insanity of last administration. It all depends on how how much science you’re willing to accept, and which you’d like to dismiss because it forces you to consider uncomfortable or frightening ideas. Do you accept that scientists understand the basic physical and chemical properties of carbon? Do you accept the simple measurements of current atmospheric and ancient deposits in glacier ice that allow us to compare the past and today? Sea level rise is one tiny componant of the rapid climate change we’re bringing on ourselves. It’s easy to dismiss something that’s so huge, and so scary. The way a summer fly may dismiss the rumor of winter, until the frost kills him. So, EXACTLY how high are the oceans supposed to be? You can take a snippet of geological time and make a case they are 200′ too low. Some years ago Al Gore predicted that the oceans would rise many feet and inundate the coastal areas for miles inland. About a year later he bought a luxurious estate on the Florida coast, overlooking the Atlantic Ocean, for several million dollars. Either he’s not listening to himself or he’s guilty of some gross hypocrisy. Maybe both. Not sure that one can draw a valid conclusion from Yachats-based observations. I’ve always figured that Yachats exists in a time warp that shields it from a greater reality. Please don’t focus on sea levels for Christ’s sake. If that is a concern, property values will be the canary in the “clean” coal mine! Instead focus on dead sea creatures. Dead creatures of GOD’s design surely do not bode well for us homo sapiens. AND! … the radiation levels in the Pacific. Anybody eating seafood out of that wetland? Buyer beware. As for Gore, nice cliff wall. No worries. When push comes to shove, I will always choose to take climate change predictions from a former newspaper editor as opposed to the Union of Concerned Scientists. After all, the scientists have an “agenda” while clearly Hering is straight shooter with the facts on his side.